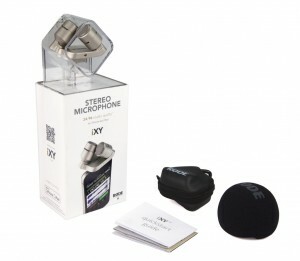 The RØDE iXY is a great recording microphone for iPhone®, iPad® or iPod® touch. Up to 24-bit/96k* recording and on-board high-fidelity A/D conversion, your iXY recordings are rich, smooth and accurate. At the heart of the iXY is a matched pair of ½” cardioid condenser capsules, fixed in a perfect 90 degree ‘near-coincident’ alignment. Foam windshield for outdoor recording as well as a reinforced protective zip case. 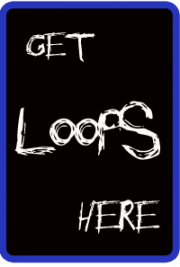 For more information and to hear audio samples visit ixymic.com. The iXY is compatible with iPhone® 4S, iPhone® 4, iPad® (3rd generation), iPad® 2, iPad® and iPod® touch (4th generation). 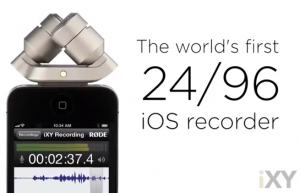 *RØDE Rec app required for 24/96 quality.